Finally! I’m free! I’m free! 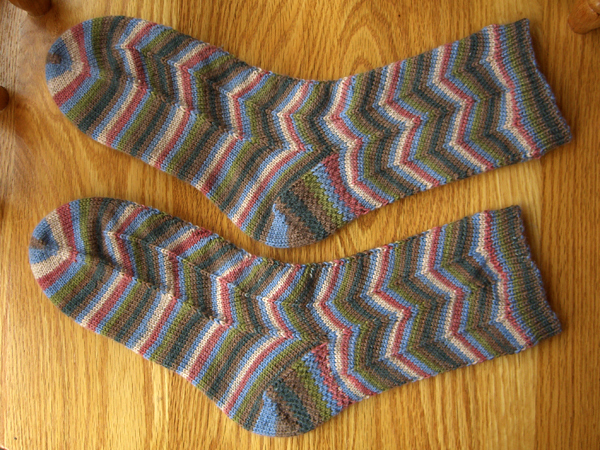 Half way into November, the Socktober socks from hell are finally finished. OK… I’ll admit it. I actually like them. Now washed and ready to go to their intended recipient at Christmas, they are incredibly soft and luxurious. I love the colors and how the zig zag in the Jaywalker pattern fits in with the African theme of the yarn color. This was a very happy marriage of yarn and pattern, and I am glad I listened to the yarn when it whispered knit me into Jaywalkers. I will definitely knit with this yarn again. I will probably not knit Jaywalkers again. I like the finished results, but I didn’t have a great time in the heat of battle. It just seemed like a fight all the way to the finish. I am sure that was an issue with the knitter, and not the pattern. Please pardon the on-my-chair picture. The best only light in the house in the winter is through my dining room window, and the handiest flat surface is a chair. The colors are pretty true, at least on my monitor. Yarn: Regia Silk Color (55% wool, 25% nylon, 20% silk / 50gr 200yds per ball) in colorway 189, Nairobi — most of two balls. I knit my standard heel rather than the heel in the pattern. I used Eye Of Partridge stitch on the heel flap. Other techniques: I used the free end of the yarn to knit the heel so as not to disturb the color pattern on the rest of the sock.